Get ready for the ultimate in rapid-fire blasting with the BOOMco. Dartsplosion 72 Blaster! Its two massive, rotating dart drums make the Dartsplosion 72 BOOMco. 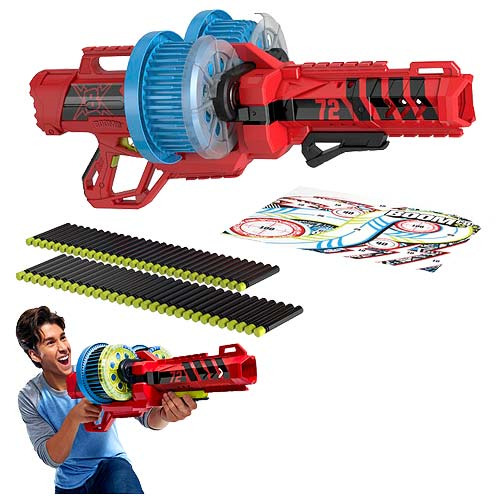 's first rapid-fire blaster, with an epic 72-dart capacity for amazing firepower! Battery power amps the action, just hold the trigger down and watch a barrage of darts fly within seconds. Change modes with the flip of a switch to single-fire blasting when you only need one shot to nail it! Be the envy of all your blaster friends with unstoppable rapid-fire action, and take your battle play to the next level! Comes with 72 Smart Stick darts and 1 Smart Stick target. Requires 6x "C" batteries (not included).